Even before I became a mother I knew that I wanted to share my love of nature with my children. As an environmental educator, I believe that children learn best through experiences and hands-on discovery in the field. I feel that if people have memorable, enjoyable experiences in nature, they are more likely to take actions to preserve the environment. When I think about how I want to share my passion for nature with my son Joshua, there is no better way than to simply spend time together outdoors. It has always felt appropriate to me that Joshua was born in March. In nature, and on my family’s farm, springtime is all about birth, burgeoning plant growth, renewal and energy. As the days warmed I found myself spending more and more time outside with Joshua. I had imagined walking with Joshua in his stroller, but my son quickly taught me that he’d rather be close to his mother’s heart, either in my arms or in a carrier. In his first three months of life Joshua visited the woods, farms and beaches, but we were equally happy lying on a blanket in the shade of our own yard. We spent my first Mothers’ Day planting our vegetable garden. A newborn experiences the most fundamental aspects of nature and the outdoors. Cuddled up next to his mother’s skin, Joshua breathed in my scent mingled with the fresh air and fragrances of the season. The light outside is brighter, so Joshua often kept his eyes closed as he nuzzled into me. The quintessential springtime chorus of peepers at dusk tickled Joshua’s ears. His skin alternately felt the warmth of the sun and the coolness of a light breeze. I found our outdoor essentials included a floppy hat for Joshua, a blanket to sit on, and a lightweight sarong that I used to help cover both Joshua’s and my own sensitive skin when he nursed in the sunshine. Sunglasses, sunscreen and a cool drink for me were also prerequisites. Another person, typically my husband or one of Joshua’s grandmas, made the experience both easier and more fun. It’s always nice to have help with a newborn. I would encourage all new mothers to spend time outside with their babies. Experience taught me that even a quick walk outdoors was soothing to both mother and baby. With my newborn in my arms in a natural environment, I could feel calmness wash over both of us. 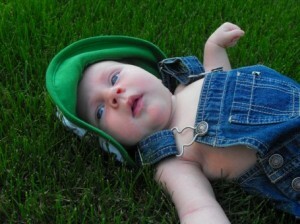 I love to be able to relax outside as a family, and I look forward to exciting adventures afield as Joshua gets older. My son was a winter baby in Wisconsin so we didn’t get to really experience the great outdoors until he was about six months old, but when we did, he took it all in and enjoyed it so much. I think some fresh air, the sounds of nature and the feeling of the breeze blowing against the skin is something that can be enjoyed at any age. This is a great post with a wonderful message. For some reason, new moms seem afraid to take their little ones into nature because they might get hurt (bugs?) Yet, they’re willing to take them to malls and grocery stores where, in my opinion, the risk of hurting a child is higher in the form of illness. Amy I’m so glad you felt inspired! The great thing about picnics is that there’s less clean up from messy eaters! We get outside on a daily basis. Each morning, our 2mo naps in the shade while toddler and I play or do activities outside. I bring both girls outside when I hang laundry or do yard work. Toddler and baby both love watching and listening to the birds in the morning, we do a lot of walks, picnics and grills. Our first trip to the cabin was when baby was 1 wk old and we even bring toddler outside on the porch during thunderstorms to learn about nature. She loves the feel of electricity in the air, the smell of fresh rain, the feel of the water on her skin and wind in her hair, the sound of the thunder and the sight of lightening.